HSLayers-NG development makes great steps. To tweak this progress and make crutial decision BOSC has prepared one week of hacking in Valmiera. During this week was prepared two new integrations of HSL-NG with actual applications. First one is integration with Liferay portal. Second one was integration with Jan Jezek’s OpenGL map application. BOSC and RTU Valmiera managed to prepare one week of Hacking to exchange knowledge between Latvians and Czech SMEs which are making development using FI technologies. BOSC and Lesprojekt is working together on SmartHoney project using FIWARE to provide better technologies for honey industry. BOSC is member of development team of new version of HSLayers. This software is used in several projects across europe.Next generation will be mainly focused on modern design including mobile version. BOSC developed offline client for PPRD East project which is used as desktop solution for web portal. Compotte is working that way that it is downloading shapefile layer through WFS. Shapefile usually contains 3 or more files but GeoServer allows to download one comprimated ZIP file. 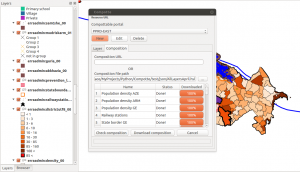 This ZIP file can be then added to QGIS. 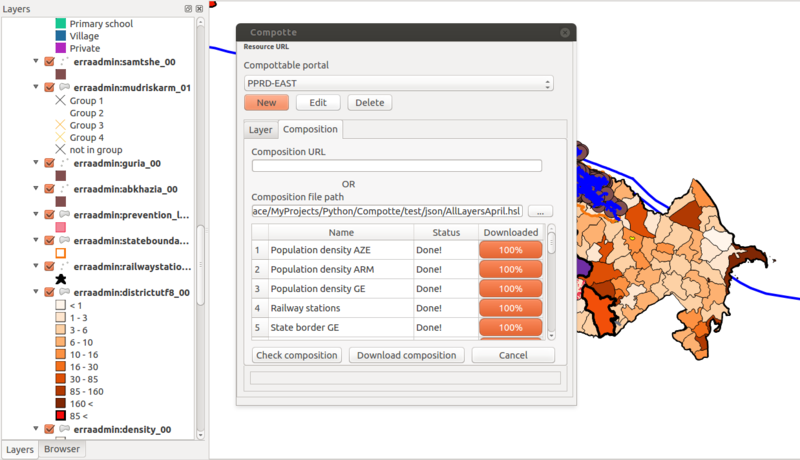 QGIS then take care of decompressing and processing of that file. Compotte then recognized all available styles for user which are available. If there are more available for one layer user then can select which one he wants to use.